Selenium is a mineral that is required by the human body to preserve good health. Although needed in small amounts, it is essential to the well being of a person. It is said that selenium may help protect against free radical damage and cancer. A deficiency of selenium in the body could cause hypothyroidism, weaken the immune system and may also lead to the development of a form of heart disease. Selenium deficiency, however, is not believed to cause illnesses, but it can increase the chances of acquiring certain illnesses as the body’s immune system becomes weak, therefore more susceptible to various forms of ailments. There are supplements available to provide for selenium in the daily diet. Nevertheless, it is considered better if selenium is incorporated in the daily diet by eating selenium rich foods. There are about a dozen fruits that are richest in selenium. The current daily value for Selenium is around 70mcg. Kiwi – It is the national fruit of China and has a distinct but very unique flavor. There are two varieties of this fruit, one is the more commonly known green kiwifruit, the other is called the gold kiwifruit. The latter has less fur on the skin and has hints of mango and banana in its flavor. The gold kiwi is very rich in selenium, about 3.1mcg in 100g. Date – Dates are very popular in the Arab peninsula and are said to provide a lot of energy. A particular variety of dates called the ‘Deglet Nour’ meaning ‘the date of light’, mainly grown in Tunisia and Algeria, has the highest amount of selenium up to 3mcg per 100g. Plantain – Plantain is from the banana tree family. Unlike banana, though, it is not suitable to eat it raw and is hence cooked before consumption. The selenium content in 100g of cooked plantain is 1.4mcg. Grapefruit – Grapefruits are a hybrid mixture of the citrus family. They come in a wide range of cultivated variety ranging from white to pink to ruby red. The highest amount of selenium is found in the raw form of white grapefruits which is 1.4mcg per 100g. Honeydew Melon – As the name suggests, it is a kin to the melon family. At the same time though it should not be confused with the other member, the Muskmelon. It has a soft and greenish flesh and is more often oval in shape. In a serving of 100g, the selenium content would be 0.7mcg. Papaya – Christopher Columbus referred to papaya as the ‘fruit of angels’, owing to its creamy, buttery texture. Once considered an exotic fruit, it is now readily available in all parts of the world. It is another source of selenium and in a portion of 100g of papaya the amount of selenium found would be 0.6mcg. Mulberry – Mulberries are not really true berries, even though they are similar to blackberries, as both of them comprise of many smaller sized fruits to form one bigger fruit. Selenium present in a serving of 100g would be about 0.6mcg. Mango – ‘The king of fruit’, mangoes are thought to be trendy, luscious in flavor and aroma, with a taste that is both sweet and acidic at the same time. There are over 1300 varieties of mango throughout the world, out of which 1000 are found in India. There is about 0.6mcg of selenium present in 100g of raw mango. Lychee – This fruit is one of a kind with a floral smell and a sweet taste. It is normally eaten raw as the fragrance gets lost if it is processed. The name of the fruit originates from China, meaning ‘gift for a joyful life’. In 100g of raw lychee there will be 0.6mcg of selenium present. Jackfruit – Jackfruit is the largest tree-borne fruit in the world. It is believed to be native to the Western Ghats of India, that later spread to other parts of the country and South-east Asia. There is about 0.6mcg of Selenium found in 100g of jackfruit. 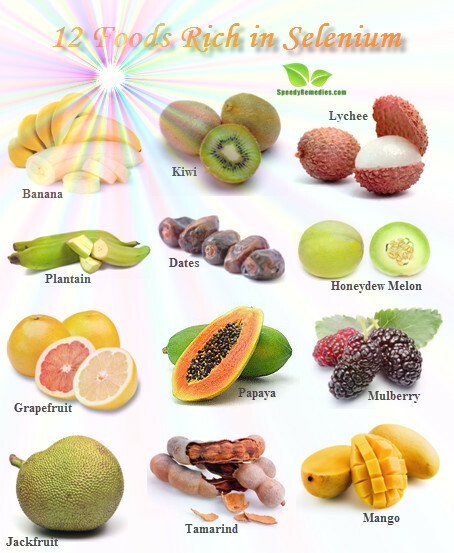 There are a whole lot of other fruits that are a good source of selenium like guava, pomegranates, cranberries, breadfruit, blackberries, strawberries, etc. However, the amount of selenium present in a food majorly depends on the soil it was cultivated and grown in. If consuming dried, or pulped version of a fruit, do check the label for the correct values of its components.